I got more of the block design finished. Greek key design and leaves. Another picture of it. See how the fullness is worked in? When the leaves were all done I went back and did the corners. Today I should get the sashing and corner stones done. Anita, AWESOME!!! 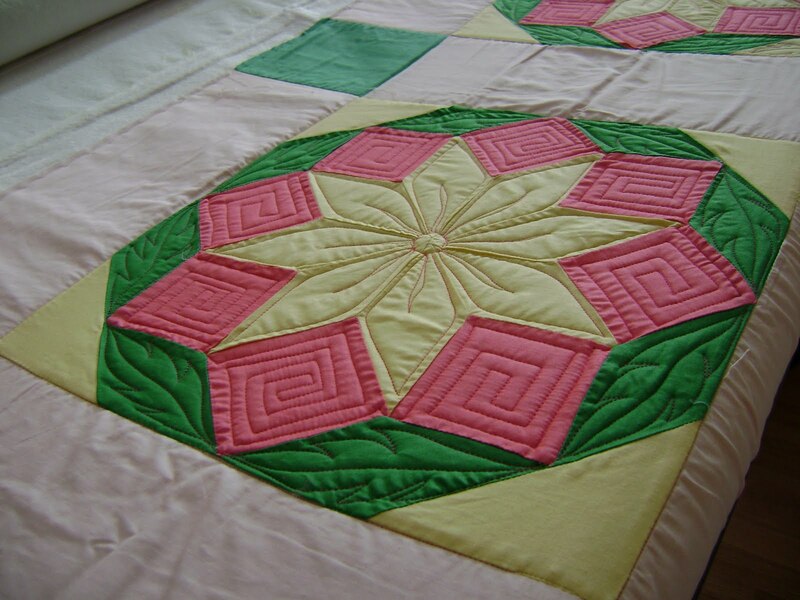 You are a master at making those problem quilts look like there was never a problem! 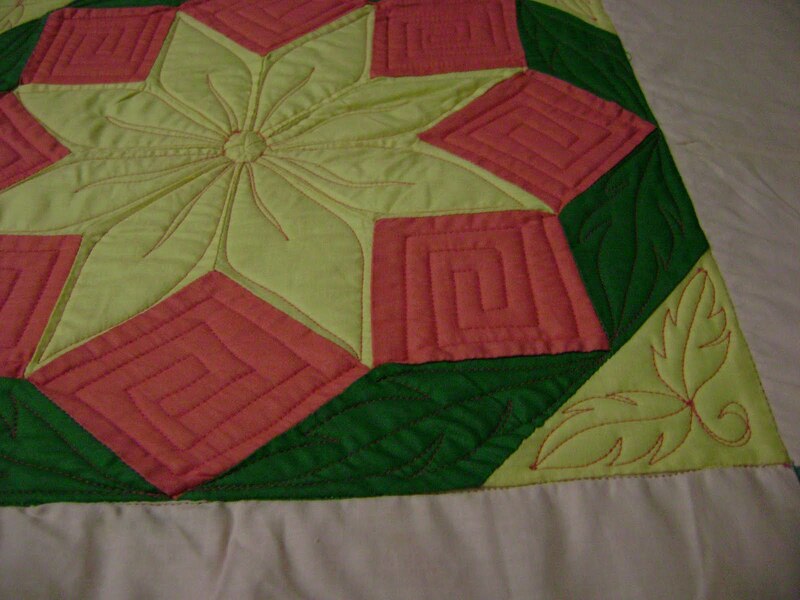 I really mean it, as you know, I also do quilts and sometimes I can't cover all the mistakes but you are SO good at it!! I am trying to catch up on my blog reading, and am so surprised to read of your retirement! I am SO happy for you. I know how much pressure there is in this line of work. Why, you can hardly tell there was any fullness in the block. You do the best you can by calling 911. Just keep that in mind. You've talked about living in a bad neighborhood before so maybe you are the only one who even tries to get help for the one who needs it. That counts for something. 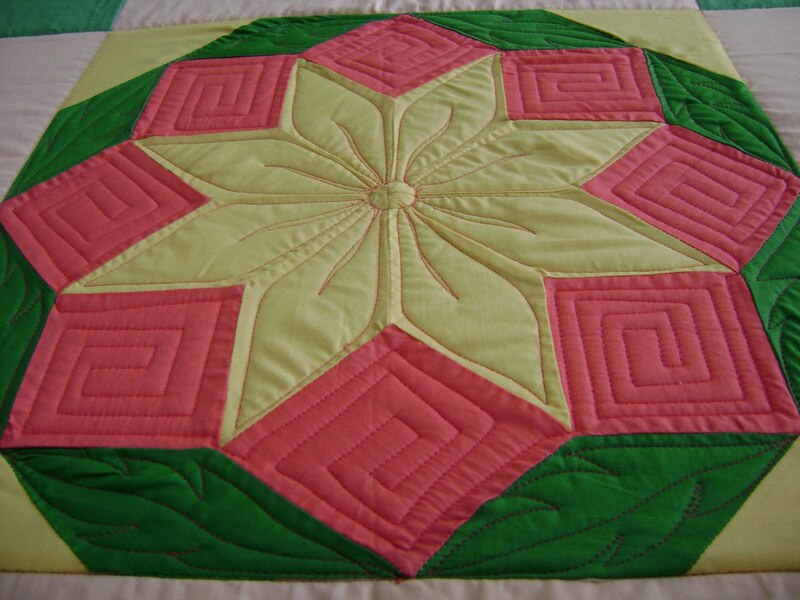 This entry was posted on August 11, 2009 by Anita in Customer quilts 2009, Issue quilts 2009, QUILTS - CUSTOMER, QUILTS - WITH ISSUES and tagged Custom machine quilting, Longarm machine quilting, Professional machine quilting, Professional quilter, Quilter for hire.